Excellent! Thank you, Paul and Co. Please don't take this suggestion as ungrateful for all these great updates but please give us the ability to select/remove races from spawning when starting a new game (i.e. Stellaris). Helps a lot for those players who want to keep some level of immersion in their games. You can already select which opponents appear in a game. You are correct and I am aware of that. I did a poor job of explaining what I mean. I was asking for the ability to select races to not spawn when you select 'random' at the start up screen...keep them from spawning at all. My silicon self thanks you for our ability to colonize! Q about ship upgrades with one per player components. Does this mean if I obtain a ‘Precursor Boom Cannon’ (not real name!) from an event, and mount it on a ship, I can later upgrade that ship and retain the cannon? "Better support for custom ships created with mods"
What precisely does this mean? Some great fixes here-- thanks!! My machine empire can colonize and terraform. You might need to validate your files. Serg, this should definitely not be happening. Can you please send in a save of this game? Is this a new game? or a saved game? 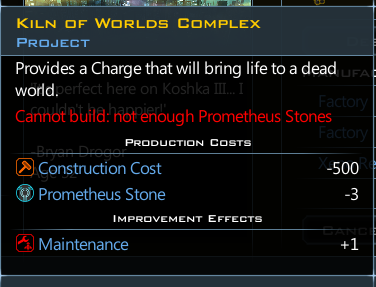 Can you find a planet that is generating tourism and send me a tool screenshot of the tooltip? I think I see the problem, do you have the Popular race trait set to -1 or -2? If you do this and have not other tourism techs or improvement you can actually end up with a - tourism value. 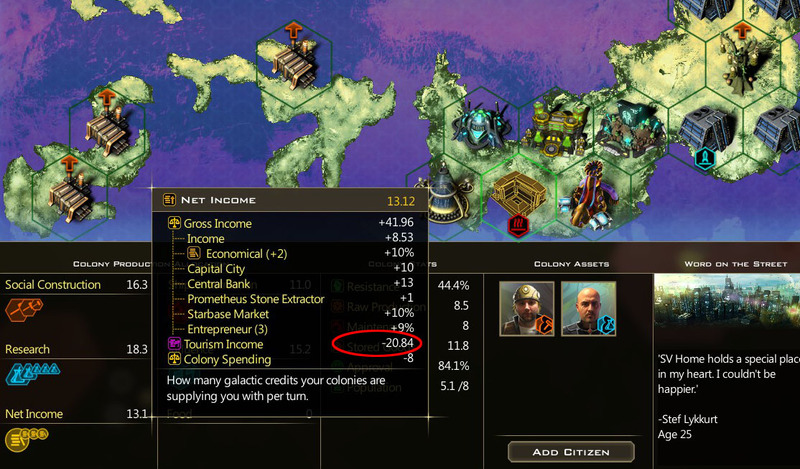 This should be floored at 0, we will get that fixed, so you will not be able to lose money with that trait. However, keep in mind if a race has that trait they will have to get above a 3% tourism rate before they will actually see any income from it. Let me know if this dose does not sound like your problem. So you can do extreme planets? I can Terra-form and colonize planets that require atmosphere cleansing but not extreme planets, even though I can research aquatic and frozen, not barren, it's not there. Even after I research, say aquatic, I still can't colonize it, because I don't have access to the tech, I can't trade for it either. I did validate, I either get one file, that needs to be reaquired or two 4 or 5 files that need to be reaquired. I have grm mod, grm terraformer mod, some tweeks to a couple other xml files, will remove them and see if that fixes them. So you can do extreme planets? that's a relief, I am not crazy, nor did I break the game, yay! Serg, your save confirms the problem. We are going to floor Tourism to 0, so this will be fixed in the next patch, but for now, you will want to avoid using the Unpopular race traits. 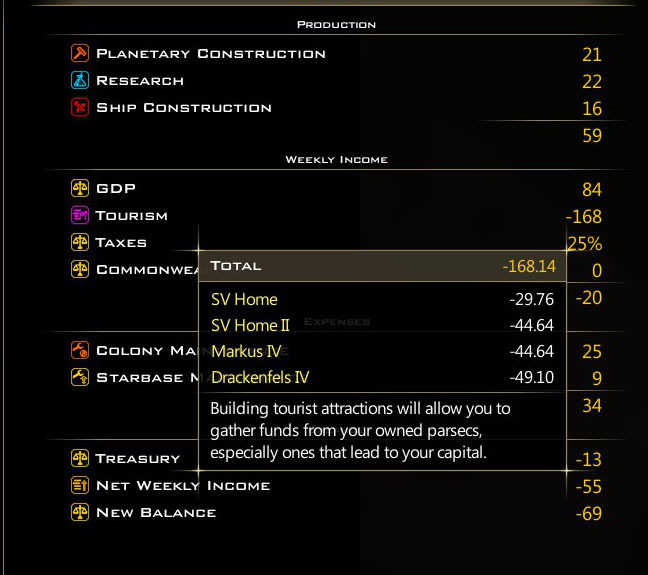 I had noticed that I was unable to build the Aid Research project on any world except the one on which I had constructed my tech capital. Definitely a bug. Thanks for the report. I've noticed in 3.5 that the food distribution improvement doesn't update to the next better tech. Bug or intentional? If a bug, was this fixed in 3.6?